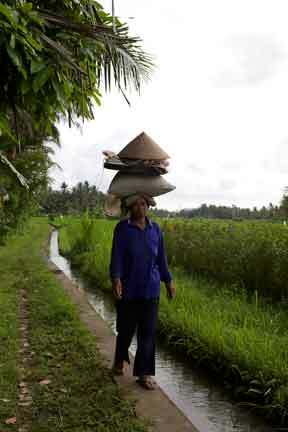 Up until a few days ago, I knew absolutely nothing about how rice is grown and harvested. 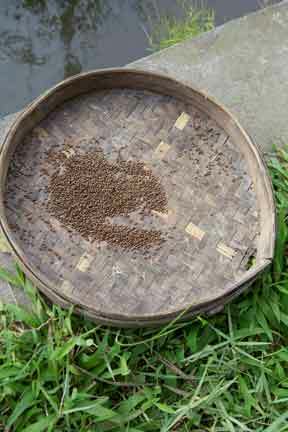 The only thing that I did know,was that rice tastes good, and that it is also a staple part of the diet here in Indonesia. It is eaten at every meal of the day and there is even rice porridge for breakfast, should you hanker for that gloopy Scots favourite. We decided on Sunday that we would stay at the hotel and relax rather than go out. We’d had a pretty full on couple of days so it was good just to stay put in one place for the day and enjoy the peace and the surrounding countryside. 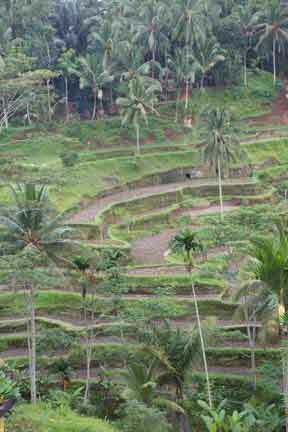 The hotel that we were staying at is about 20 minutes drive, west of Ubud. 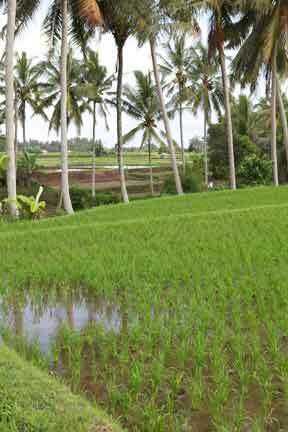 It is situated on the edge of a small village and surrounded by paddy fields and forest. Pedro decided to spend his afternoon drawing plants, and I booked the services of a guide called Oka, to show me a good time around and about the paddy fields. In the heat of the day, Oka and I left the hotel and set off on our 3, hour hike armed with water bottles and camera. I couldn’t have wished for a better guide and companion. Our first stop was the village Subak, which is a bit like a community centre, but much nicer. The Subak has it’s own small temple and shrine. 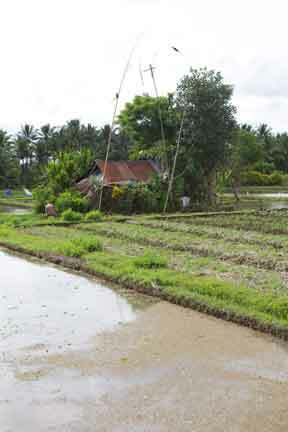 It is a democratic meeting place where the villagers gather and talk about irrigation (Sangkep subak) and resolve issues regarding the upkeep and maintenance of the paddy fields. 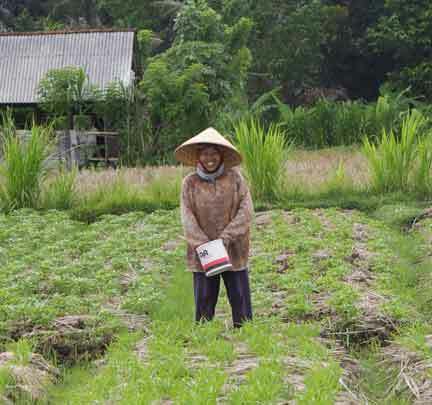 Rights to grow and harvest rice on the paddy fields, are handed down from generation to generation and I felt a real sense of community and pride as Oka took me to meet his wife and show me his particular part of the paddy field. As you will see from my photographs, the fields are in a constant flux of various stages of growth, harvesting or lying fallow. 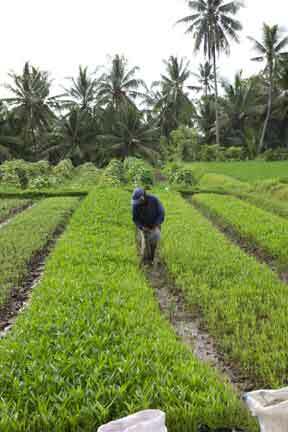 The thing that really tickled me was learning about when the rice is planted. 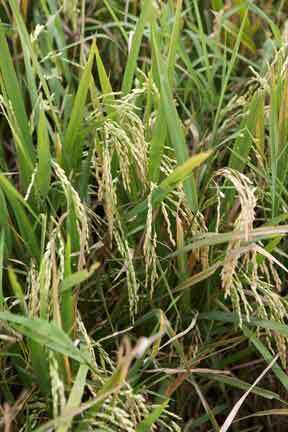 Rice is only planted on what are considered to be, auspicious days. 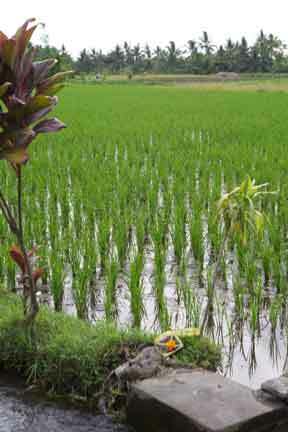 ‘The Balinese believe that rice is a gift from the Gods and part of an all encompassing life force of which humans partake’ – ‘The first fruits of the harvest are given back to the Gods, and complex ceremonies and festivals, accompany every stage of growth in the life of the rice plant’. I just loved seeing all the offerings placed beside the fields, and decorations, fluttering in the breeze tied to bamboo stakes. 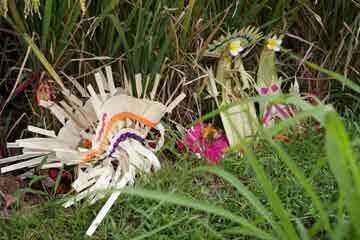 These wonderful embellishments are to ward off evil spirits and give thanks to the Earth Mother for their good crop. At the edge of the fields there were, what I initially thought to be ornate bird tables, (the last thing you need in paddy fields is birds!) 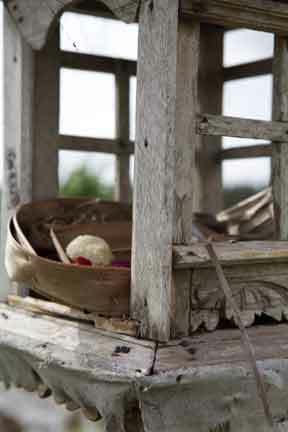 but they were in fact wooden shrines to place offerings in. 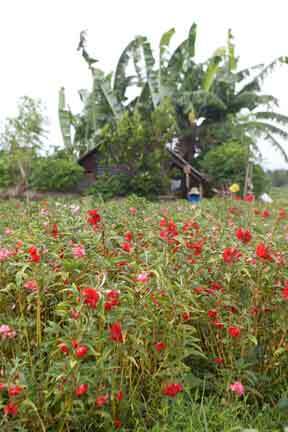 I had a good look, and some of them had tiny handfuls of cooked rice and fresh flowers, ornaments and trinkets. 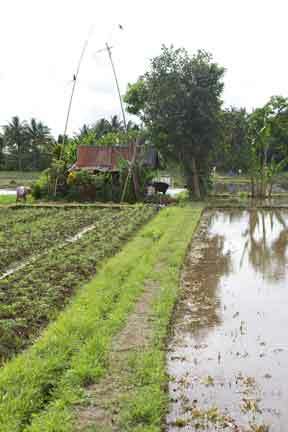 Irrigation to the rice fields is absolutely paramount to maintain healthy crops and keep the rice watered. I saw people standing knee high in mud mending the earth divisions that divide the plots, and using their feet to tread down the muddy bottom of the fields before re-sowing. 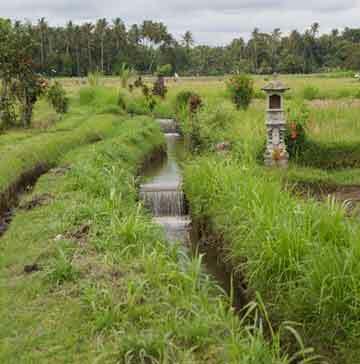 Although the Dutch have pretty bad press in Indonesia due to all the rotten things they did over a 200 year period, the one good thing they did, was build dams and irrigation systems throughout Indonesia. When I fessed up to Oka that I was half Dutch his face fell a mile and I thought it might be the end of our beautiful relationship. However, when I told him that my Dutch great, great grand-father (Dignus Van de Putte) married an Indonesian lady and that I had a little Indonesian blood in me, we mercifully got off on a happy footing again. Isaac Dignus Fransen van de Putte, (born March 22, 1822, Goes, Neth.—died March 3, 1902, The Hague), Liberal Dutch statesman who energetically attacked the exploitative colonial system in Indonesia. 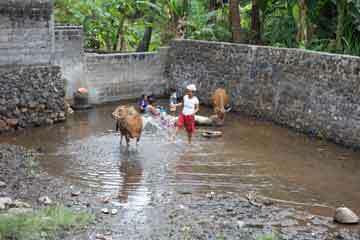 The river flowing deep down in the gorge is the water supply for the rice fields. Despite being a self-professed ‘leading authority’ on rice, I am still struggling a bit to work out how the farmers actually manage to get the water up into the fields…. I may have to do a bit more research in that area. Oka and I left the fields and climbed down the steep, slippery, tree rooty banks of the gorge and into the relative coolness and shade of the forest bottom. A large shrine with its colourful offerings had been built close to the river and he took me to see the ‘Holy water’ coming out of a spring in the hillside. 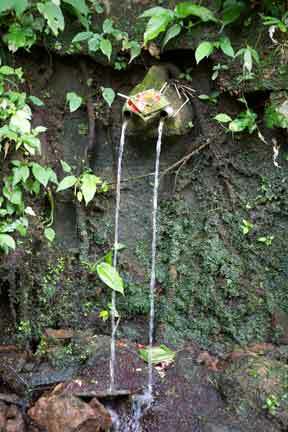 This water is bottled and used by the villagers for their blessings and rituals. We saw women and children bathing in the river and washing their clothes and they smiled and waved as we passed them by. In the open clearings on the forest floor, women were tending small patches of cultivated land. They were weeding out their spinach and sweet potato beds, and rooting up yams. 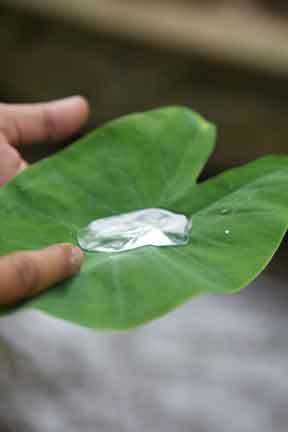 Around us were tall palms whose sap is tapped daily to make the alcoholic drink Tuak, which is a much favoured Balinese tipple. Oka told me it made him ‘strong’ for his wife, but if he had too much, it sent him to sleep!! There was one point towards the end of the walk when I had a perfect photo opportunity that I stupidly missed due in part to shyness, but also out of respect. It happened just as we were about to cross a concrete dam of about 20ft in length and just 6 inches wide. It was built around 20 ft high above the deep, swiftly moving river. A terrifying proposition for me as you may remember from previous blogs, that I have an absolute fear of heights and my balance is crap as well. Anyway, I digress as at that moment, a woman of around 70 years or so passed by. Dressed in a bright sarong with only a black bra on the top half she walked passed us with the most incredible headdress I have ever seen. It must have been at least a foot high and was made of flowers, and palm leaves and rice stalks. It was a vision, I tell you. If I had seen something similar in Ubud I would most likely have been cynical and thought that it was just some fancy get up for the tourists, but this was deep in a jungle, miles from anywhere. She disappeared silently into the forest and Oka told me that she was going to make an offering of her headdress to the Goddess of Fertility. It gave me goose bumps; it was such a magical sight. Mercifully, by gripping on tightly to Oka, we crossed the dam safely then climbed up the other slippery side of the gorge and out into the bright daylight. Migrating workers from Java were busy feeding the newly cut rice into noisy threshing machines and others were burning the rice stubbles and making bonfires. 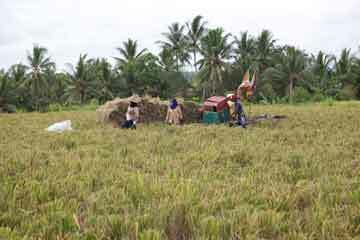 It was a hive of pastoral activity, and in the late afternoon light, looked like a scene from an old painting as the workers stooped to pick up bundles of rice stalks and lay the rice out in sacks on the ground, chattering and shouting amongst themselves. camp in the fields overnight as they are essentially travellers. 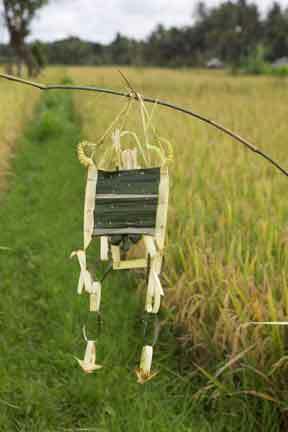 We watched a man making a ‘rice dolly’ to offer to the Gods for thanks for the harvest and close by, a woman was busy sowing flower seeds for her next crop of Pacar which she will then sell at the market when it is ready. ← Thank you all, for a wonderful day!